At Genesis Pro Roofing, we pride ourselves in our solid commitment to excellence and ethics. A job that is done correctly and efficiently benefits you, the customer, because it enables us to keep our bids and costs at a price that is great for you, along with the peace of mind of a quality roof. Starting with each bid, we visit your site to ensure that every detail is accounted for, allowing us to accurately plan, bid, and prepare for your project. 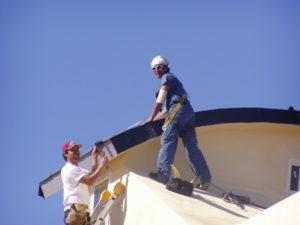 Our experienced and knowledgeable staff will help to decide which roofing options are best for you. Not only do we install your roof with care and precision, but we are 100% bonded and insured, adding extra peace of mind. We are a group of overachievers that have come together to create a premier brand company in an industry that is generally just about services. What makes our company different is our strong background in customer service. We have taken skill levels from varied backgrounds to create Genesis Pro Roofing. Whether it be for a large property management company or a private residential owner, we understand that going through the process of any type of construction can give uneccesary stress. Our expertise in handling all the details will help make it easier, along with our desire to make your experience with us easy and stress free. At Genesis Pro Roofing, we are committed to excellence and giving you the best, from the beginning of your project till the end. We look forward to serving you. To learn more, call us during office hours 9 AM to 5 PM at (909)217-7373 or email us at sales@genesisproroofing.com. For your convenience, all major credit cards are accepted.